Dow Theory Describes Charles Dow's famous theory of market movements in detail. In particular, this article discusses the three stages of bull and bear markets. 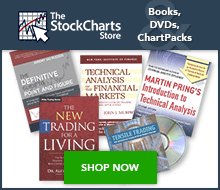 Readers will also learn how to identify Dow Theory buy signals, sell signals, confirmations and non-confirmations. Intermarket Analysis A top-down approach to understanding the stock market through its relationships with bonds, currencies and commodities. Sector Rotation Analysis A performance-based approach that relates the economic cycle to the relative strength of stocks in different sectors and industries. The DecisionPoint Chart Gallery A collection of market analysis indicators created by DecisionPoint for help with understanding the market's current trend. DecisionPoint Rydex Asset Analysis The DecisionPoint approach to using Rydex Asset ratios to analyze market sentiment. Wyckoff Market Analysis Describes how Richard D. Wyckoff approached broad market analysis. Learn how to define the broad market trend, identify major tops and bottoms, project prices and determine price position within a move. Wyckoff Stock Analysis Describes how Richard D. Wyckoff picked individual stocks. Learn how to isolate the strongest groups, cherry-pick stocks within these groups and manage the trade once it is underway. The Wyckoff Method: A Tutorial An alternate explanation of the Wyckoff analysis method with sections on Wyckoff's Five-Step Approach to the Market, his Price Cycle, his Supply/Demand analysis, his Buying and Selling tests and his P&F counting guide. Part 1: Introduction to Elliott Wave Theory The terminology, waves, rules and basic concepts that define Elliott Wave Theory. Part 2: Identifying Elliott Wave Patterns An overview of Elliott Wave types and their identification criteria. Part 3: Guidelines for Applying Elliott Wave Theory Six guidelines for how to apply Elliott Wave analysis, as well as personality observations and how to mark Elliott Waves on SharpCharts.